What Day Of The Week Is December 16? 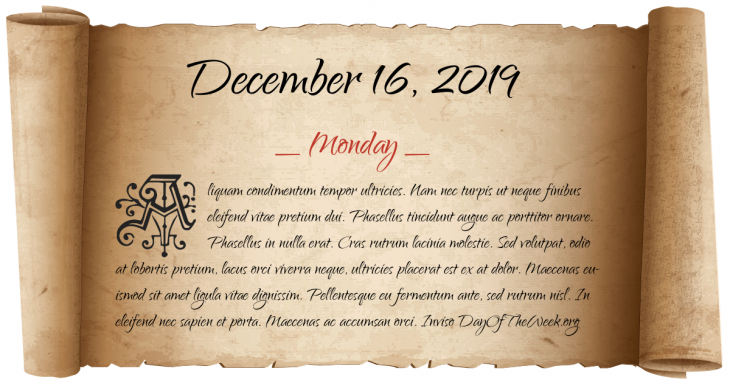 December 16, 2019 is the 350th day of the year 2019 in the Gregorian calendar. There are 15 days remaining until the end of the year. The day of the week is Monday. Henry VI of England is crowned King of France at Notre Dame in Paris. American Civil War: Franklin-Nashville Campaign – Battle of Nashville – Major General George H. Thomas’s Union forces defeat Lieutenant General John Bell Hood’s Confederate Army of Tennessee. Bank robber Herman Lamm and members of his crew are killed by a posse of 200, following a botched bank robbery in Clinton, Indiana. Bangladesh Liberation War and Indo-Pakistani War of 1971: The surrender of the Pakistan army brings an end to both conflicts. Who were born on December 16?